Lunarpages solutions are at the forefront of industry standards, and are powered by Dell PowerEdge servers, the most innovative and secure servers in the industry. Their most popular Basic Web Hosting package is an incredible value at only $4.95/mo, and includes: UNLIMITED GB Storage Space! UNLIMITED Bandwidth FREE website templates, Free Domain Name $775 Free Website Software and Services, Special Offer on Webhosting Transfers, Hosting for UNLIMITED, Websites on 1 Massive Plan, Frontpage extensions MySQL, PHP, PERL, ASP, Python, JSP, and Ruby on Rails. Right now at LunarPages.com you can get a free iTunes gift card w/ this coupon code. Act now and you can save $28 Off plus 1 month free on select plans from LunarPages.com. Sign up for select plans at LunarPages.com and you could get up to $775 in bonus services and software. 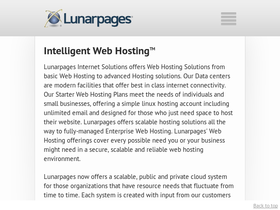 LunarPages.com offers free web hosting for educational purposes to all K-12 public schools in the U.S.
Purchase an annual web hosting plan from LunarPages.com and you will get a Free Domain name. LunarPages.com is now offering unlimited storage and unlimited bandwidth for just $4.95/month.